Not for the squeamish! 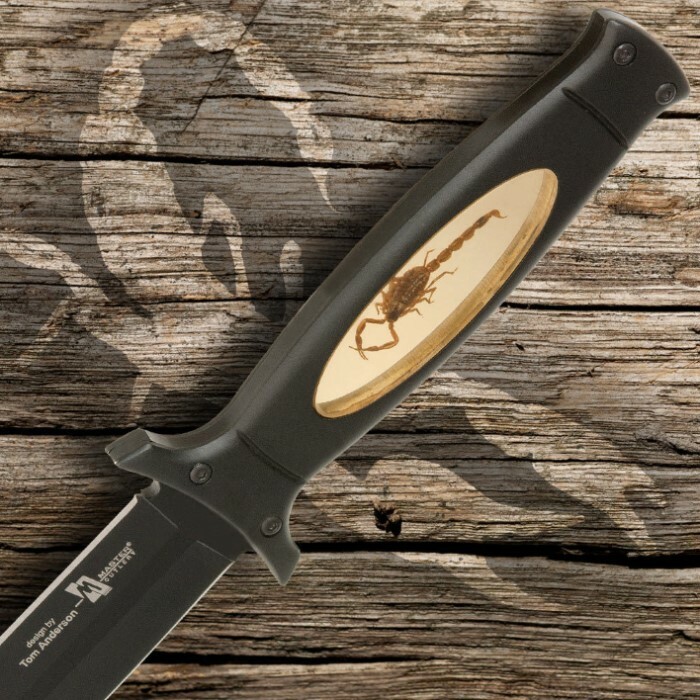 This boot knife has a real scorpion forever sealed within the handle! Famed fantasy weapon designer Tom Anderson has done it again with this Scorned Scorpion Double Edged Dagger creation. This piece brings a modern twist to traditional boot knife style. Real scorpion cast in Lucite within the handle. 440 stainless steel blade with black finish, 4 3/4 in. Includes leather sheath with snap closure and clip for boot or belt carry. This is a pretty good knife, it comes with both edges sharpened, my only minor complaint is in the picture there is a white background in the handle. In reality,the handle is clear,so scorpion is not as noticeable.Still overall I am satisfied, and will order again . I just got mines in and I'm impressed I love the knife and I'm satisfied with my purchase, razor sharp out of the box has a fine edge like to suppoesed to be, has a nice, strong, durable sheath, I like the little scorpion in the handle, no problems with this knife at all even if it's not genuine or real made, a must have affordable good for the price no complaints here. This is a really cool knife. The scorpion is beautiful. It is well weighted, has a nice, strong, durable sheath, and isn't even noticed in my boot.The double edged blade has been strong and sturdy, but not too sharp. The lucite is fairly fragile though. Don't toss it, throw it, hit it, or (depending on hight and material) drop it. The lucite will break, or chip, and the metal may bend, and a couple of the screw things have fallen out. I have had it a little more than a year now. I got it for christmas in 2012 and was ecstatic. I am tempted to buy another one that I would take much better care of (which I'll probably do). It is a fantastic knife if you take care of it. It only got a three because I wanted it because of the scorpion, which is now loose, due to chips and missing screws. I would definitely recommend it. very happy with this cool little knife. just give it a sharpen when you get it and its perfect. great price to. Well I bought this knife mainly because of price. I wanted a decent fishing knife that I was not worried about damaging. Wow was I surprised great quality for the price nice edge. I sharpened it a bit and man went through paper like butter. The little scorpion grip was kinda kewl to. all in all good buy for the money. Overall this is an extremely good knife and I like it a lot. But the day after I got it the scorpion inside the handle fell out. It is a good self defense knife to keep in your boot, good for hunting and fishing when needing to cut worms to rope it's a good knife! !